When most people imagine a shopping trip to New York iconic stores such as Bergdorf Goodman, Bloomingdales, Tiffany’s, Macy’s and Saks Fifth Avenue probably pop into mind, and though I enjoy a trip to all of these New York institutions it’s the indie boutiques that really get me excited. New York is huge and has thousands of incredible stores but here is my pick of where I like to splash my cash, or simply peruse the racks. 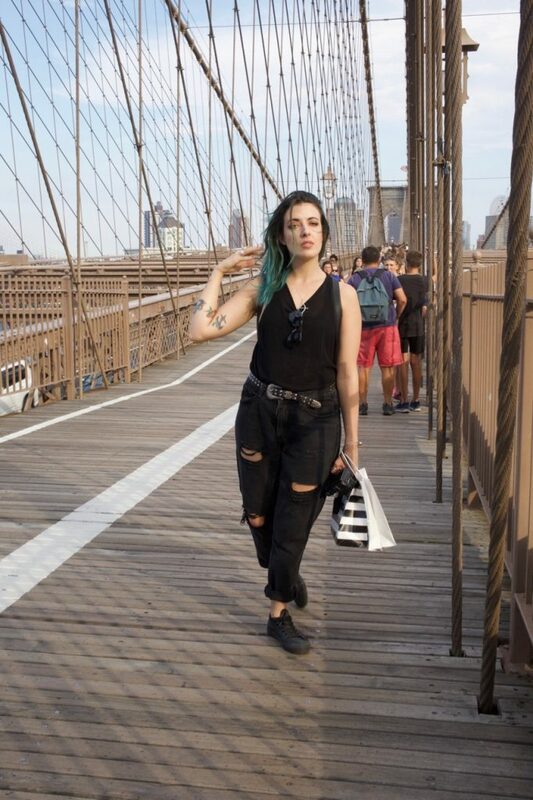 Brooklyn doesn’t follow the fashion pack and has a style all of its own which is why their shops are so uniquely great. Concrete + Water – A lifestyle boutique selling clothing and household products with a focus on quality design. This clean cut modern store caters for every style; a mix of vibrant colours and muted tones reflect the contrasting styles of Brooklyn where this store was born and raised. Catbird – A tiny boutique focussing on responsibly made, delicate jewelry. Not only are these beautiful pieces, but with each sale money is given to charity, making you feel extra good about your new purchase. Task – Naming itself as a neighbourhood emporium, Task sells items for your home and wardrobe that are based on contemporary style and are made with the purpose of being long lasting. 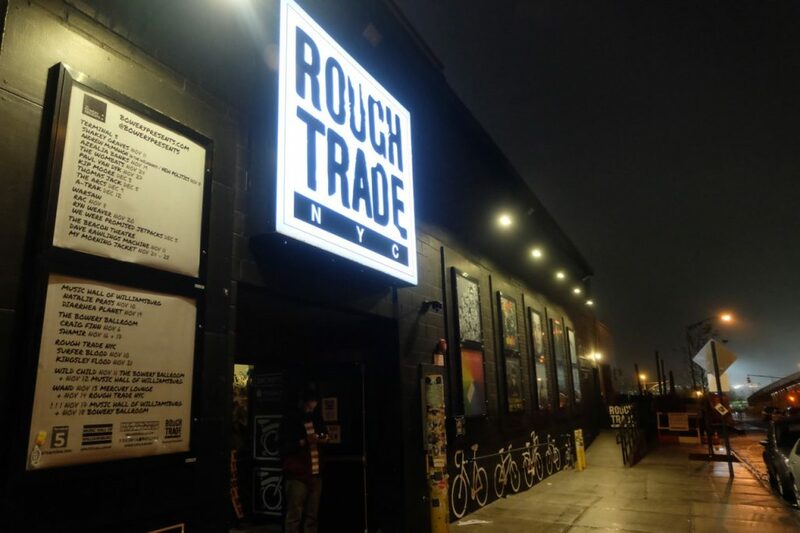 Rough Trade NYC – I know I could get my Rough Trade fix in London, however, in classic American style this branch is of course much bigger than its london sister store. Rough Trade is predominantly a record store, but also has a pretty large stage area and bar where it hosts a variety of events. Pilgrim Surf + Supply – As might be given away in the title, this store is focussed on cool surf style, but whether you hit the waves or not they stock an awesome range of laidback and hard wearing clothing and accessories. Life:Curated – Another store which sells lifestyle products including clothing and household items. This store has won numerous awards since opening its doors to the cool industrial chic space back in 2010. 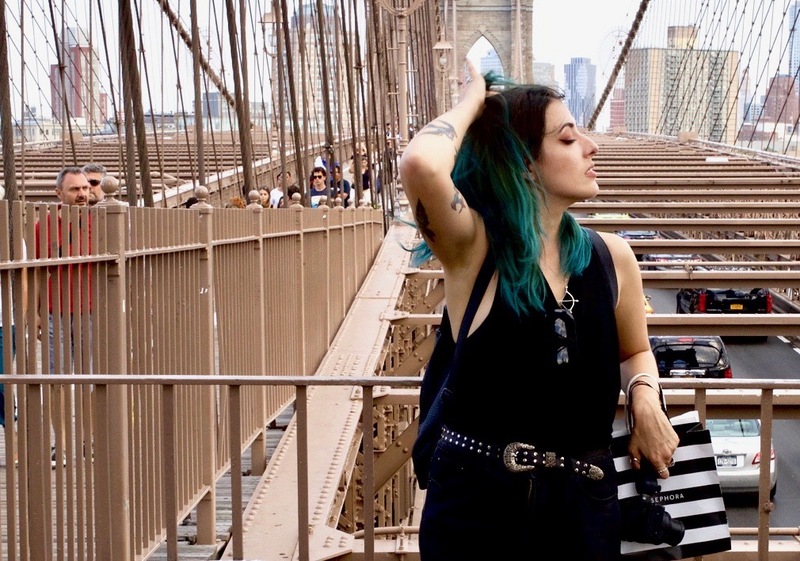 Beacon’s Closet – Out of all the amazing thrift stores in New York this is where I find the most amazing pieces for the best prices. Some of my highlights include Nike high tops, leather converse, a Dolce and Gabbana top, a Rag and Bone top and a Helmet Lang top – the most expensive of which was $25! The stores are also arranged by colour, making it easy for a goth like me to navigate. Alter – Yet another awesome lifestyle store, just as cool as the others but with a focus on stocking affordable items whilst retaining their cool factor. In God We Trust – Started back in 2005 with the aim to bring together the best locally produced pieces. The stores have a vintage look but concentrate on new products with a retro flare, stocking womenswear, menswear and homeware. Friends – Located in Bushwick (I’ve got a full area guide here if you want it) it is a one floor department store, selling vintage, new indie brands, shoes, and gifts. Though small, I could spend hours browsing through the quirky stock, and I always end up making a purchase. KCDC – A tiny, low key, skate boutique selling a good range of boards, trainers, and skate brands. 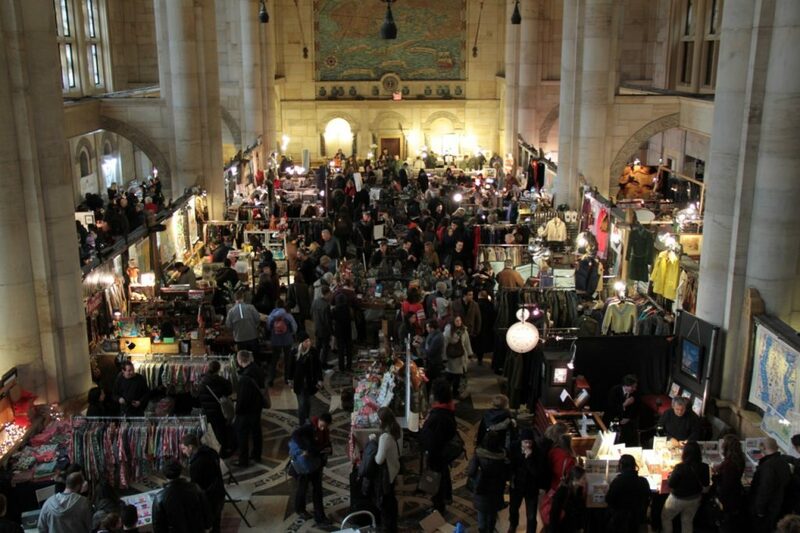 The Brooklyn Flea – One of my personal favourite places to shop in Brooklyn as the variety of venders really represents the endless creativity in this borough. Selling crafts, art, vintage, clothes, antiques, and amazing food you can find anything your heart desires at this awesome market. It does move around depending on day and season, so check out the website before you plan your visit. Bird – Known as the shop that started this boutique trend in Brooklyn. Bird has maintained its popularity as well as its strict sustainability standards. Though Bird is a little out of my price range stocking brands such as Acne, the spacious setting makes it an enjoyable place to window shop and dream of being rich. 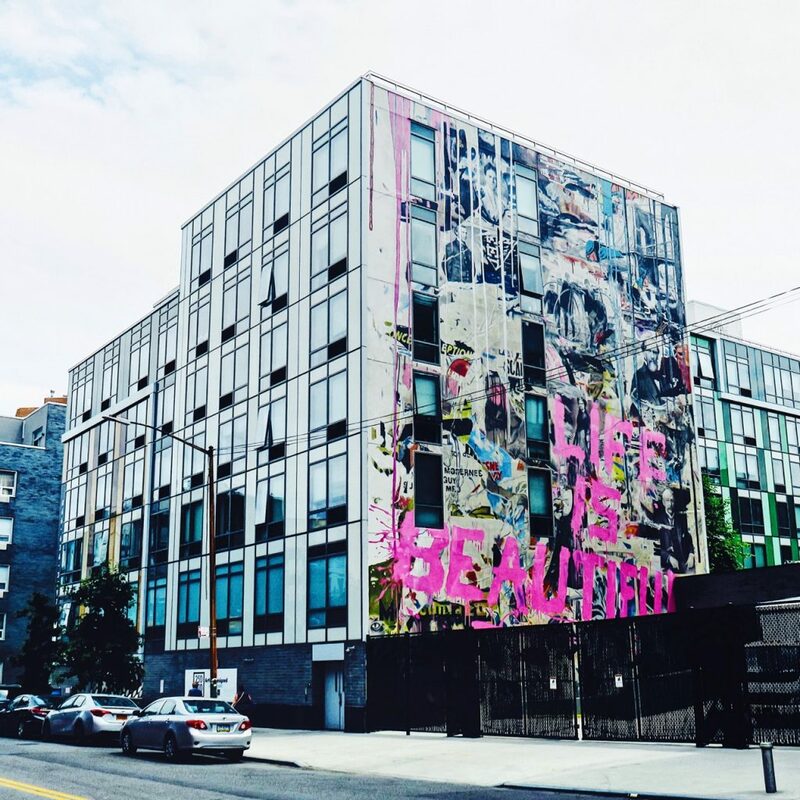 The Mini Mall – The shops inside this Williamsburg mini mall are always changing making it a new experience on every visit; from vintage clothing, to quirky homeware you never know what you’re going to find. Though it may be small in size the mall also has a few communal areas if you need to rest during your spree. Manhattan is huge and though people usually flock to Midtown to get their retail therapy on Fifth Avenue, I prefer to stay clear of the chaos and stick to Soho and the East Village. Verameat – Though now available in many locations, Verameat was born in New York. I first discovered this quirky jewellery store a few years back when I stumbled across their flagship store in the East Village and is one that I always return to when I am in town; I love the mix of delicate class with quirky statement design in each piece – also the staff are always a dream. 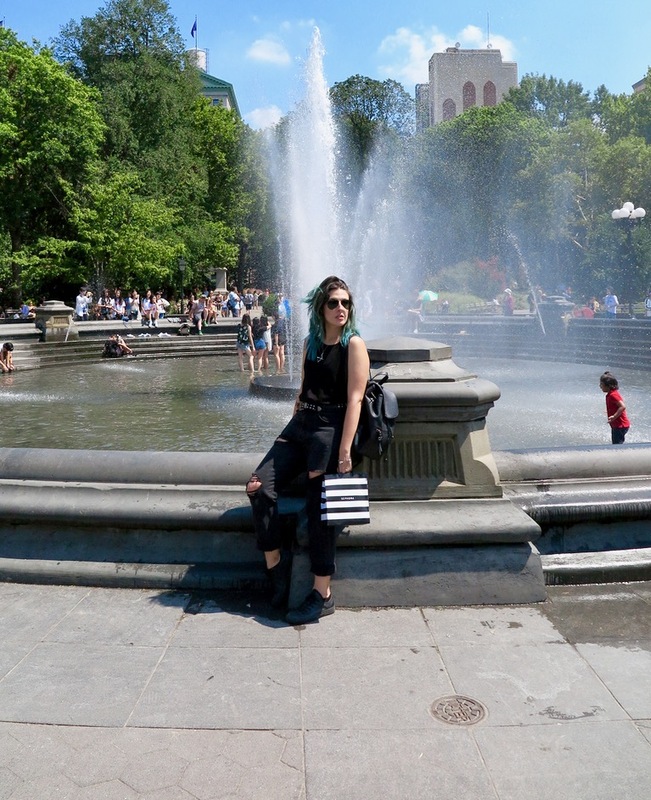 Cloak & Dagger – A super cute East Village boutique selling high quality original clothing and curated vintage. Stemming from the brand’s creator, designer Brookelynn Starnes, who was frustrated at the rise in fast fashion and decline in quality and garment construction. Opening Ceremony – Starting out as one store in NYC back in 2002 this brand has now seen success worldwide, but there’s nothing like visiting where the story began. The original space has expanded into two stores next door to one another, where not only many beautiful clothes are sold but also has been the location of many iconic NY parties. The Great Frog – You know by now this is my favourite jewellery store ever, and is even where my engagement ring came from (you can check out the full NY proposal here). Originating in London, the creators of the skull ring now have branches in LA and NY and, naturally, I have visited both. The New York store welcomes you with two rad bikes, their usual awesome service and – if you’re lucky – a hug with their shop dog. Search and Destroy – If organised chaos is your thing this edgy boutique will be right up your street. 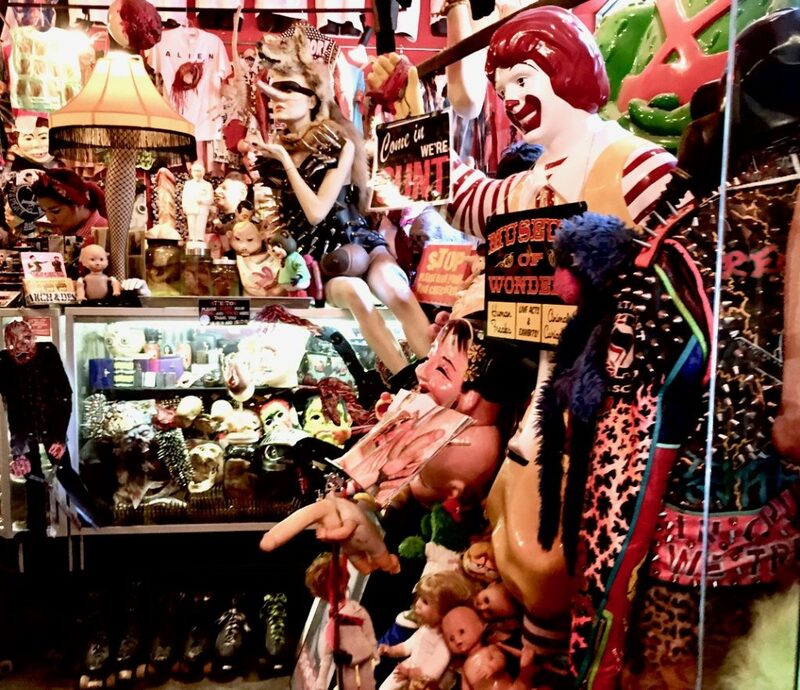 Packed with literally floor to ceiling rock memorabilia and punk vintage, all complemented by super creepy installations this is not your average vintage store. Insider tip: though it might not seem like it, there is method in the madness and all band t shirts are in alphabetical order. 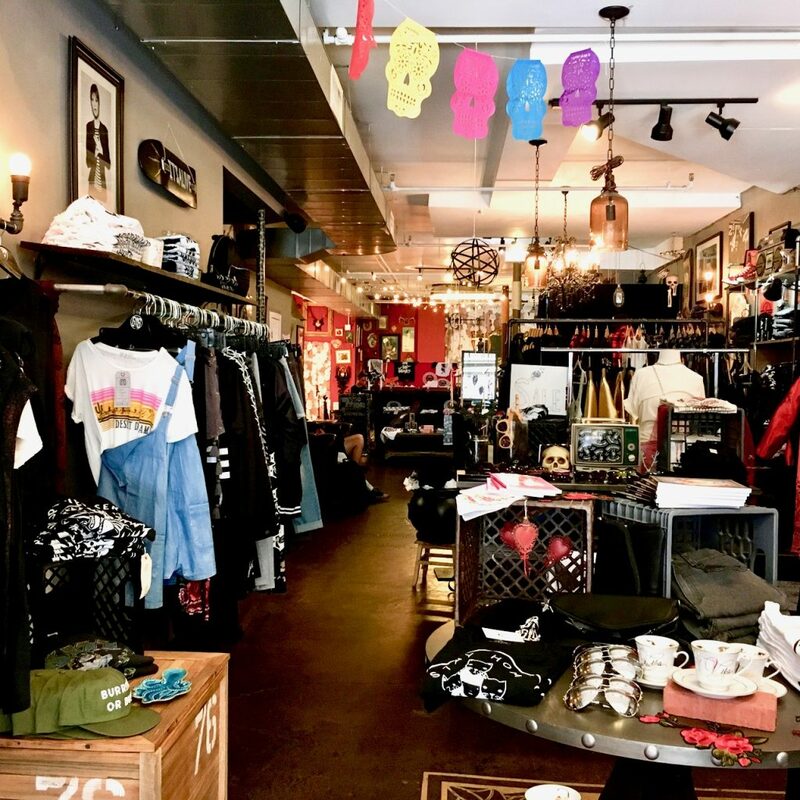 Screaming Mimi’s – An awesome little vintage spot where the clothes are beautifully curated and are conveniently ordered by era. 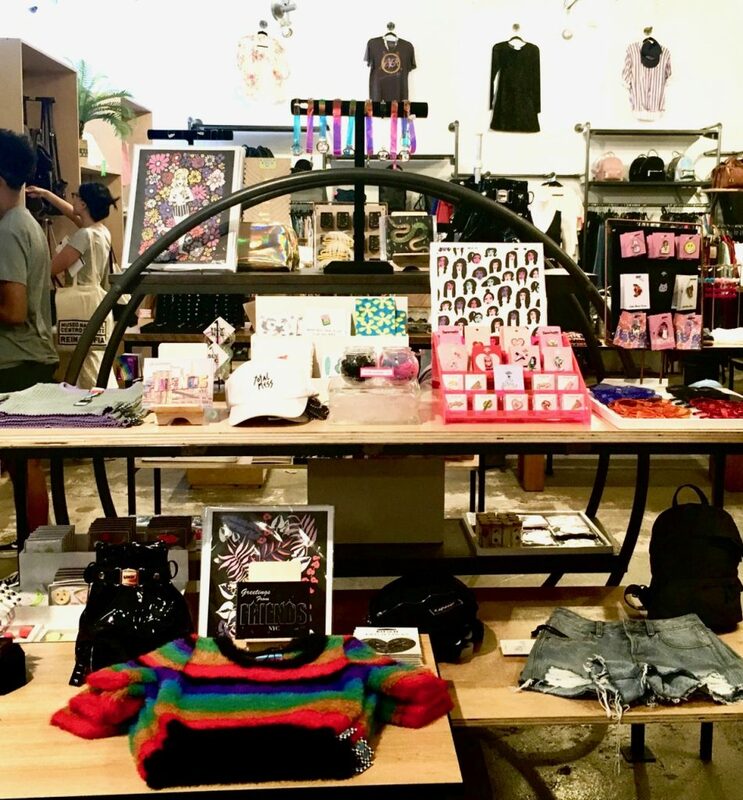 Artists and Fleas – Similar to Brooklyn Flea this small market has now expanded out to 4 locations: Chelsea Market, Soho, Williamsburg, and even LA. I have been lucky enough to visit all four and love rummaging through the eclectic stalls. 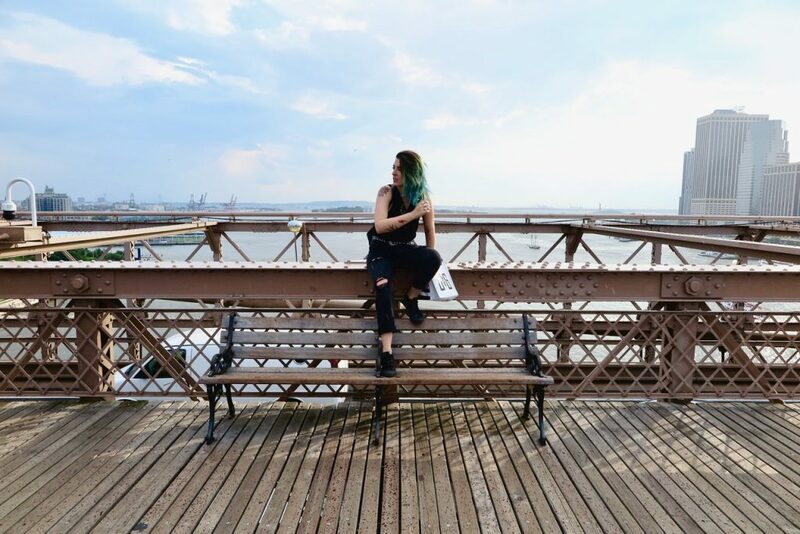 On a side note if you want more of my NY adventures, I vlogged it! 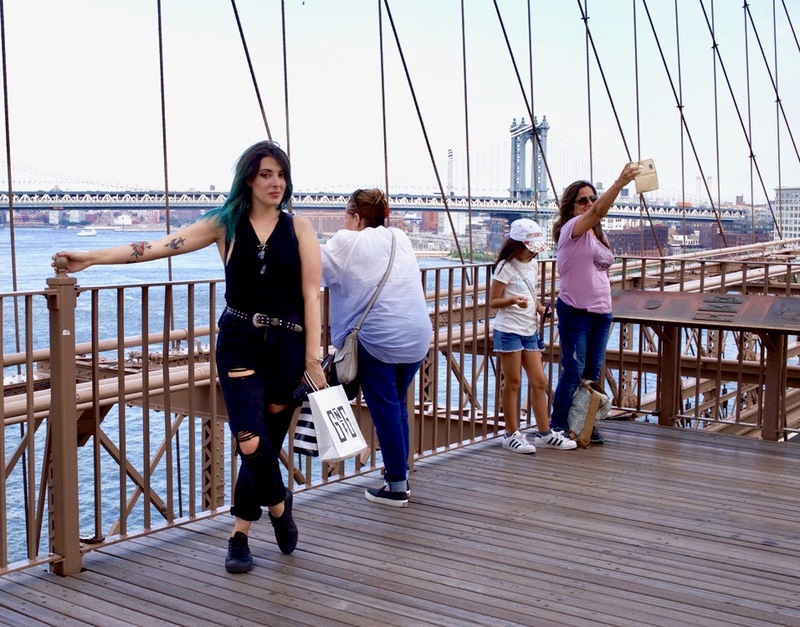 Do you guys have any favourite places to shop in The Big Apple?